A beautifully furnished, 6-bedroom/6-bathroom ski-in/ski-out home located at the base of the Jackson Hole Ski Resort in Teton Village, Wyoming. 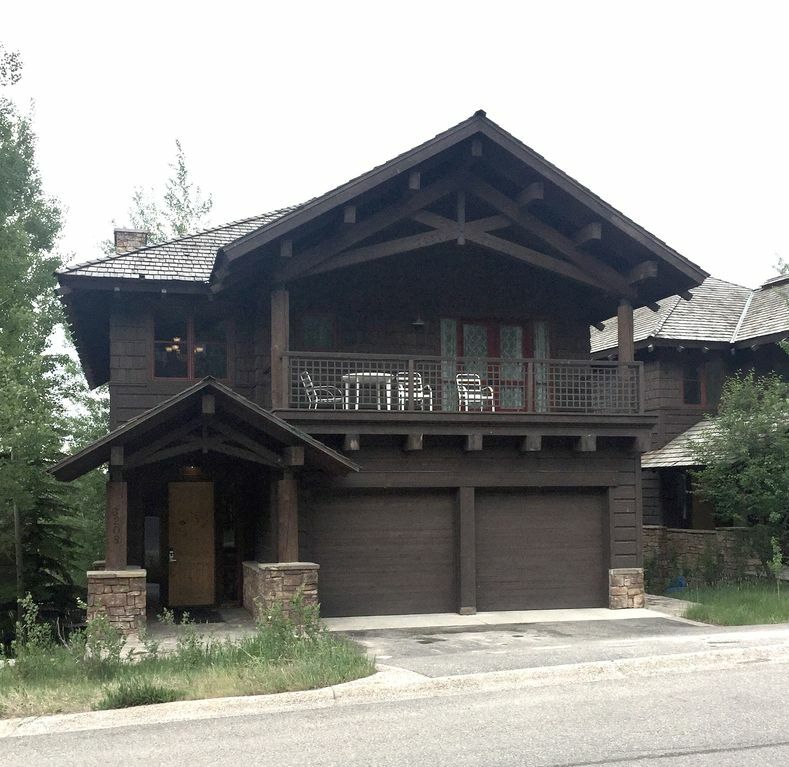 This incredible Granite Lodge home is new to Teton Village. It is in a ski-in/ski-out location, giving you immediate access a rope tow to the Teewinot Run. With its great southern exposure, the home is extremely warm and inviting. Located at the base of Jackson Hole Mountain Resort, you’re just one minute away from shopping and restaurants in Teton Village. The beautifully furnished 3-story home boasts approximately 4,100 square feet of living space, including 6 bedrooms and 6 full baths to accommodate up to 16 guests. The home also offers several unique amenities to help make your stay as comfortable as can be. Jackson Hole offers terrific skiing in the winter and numerous outdoor activities in the summer. It is also just 60 miles south of Yellowstone National Park. Media Room with 7 foot Movie Screen & DVD player, Fax, No Pets. First off, the greeting basket was very nice. We used all the fruit and cheese and the snacks and drinks were very good, too. Thank you! It was a nice touch! Our family reunion was made special by staying at this house. The kitchen, dining room, and living room held all of us without anyone sitting on the floor. The dining room table was the best! It was large enough to invite extra guests over. The kitchen appliances were in good working order. Coffee drinkers loved the coffee “pot”. There was plenty of seating in the living room, too. The wet bar was nice with the extra refrigerator. The deck seating could have been better. More chairs are needed for the summer. The hot tub was large enough for four people at a time. The outdoor grill was a three burner, I believe, not four. It was a little cramped for six large steaks cooking at a time. The location was perfect. It worked for us. I can imagine even better in the ski season! It is within walking distance to the village, either by the hill side or down the street. We enjoyed the village and the trams, gondola and chair lifts up the mountain for hiking, eating, and sightseeing. No need to drive and try to find a parking place at the base of the mountain. The garage was large enough for two full size SUVs with the driveway long enough for two other cars. The bathrooms are spacious and clean. There were plenty of towels and they provided soap and shampoo, as well as conditioner, which was nice. Not all rentals provide that kind of stuff. Each couple had a bedroom with a bath, except for one bedroom downstairs. It really isn’t a bedroom. It has no window or closet. Nor does it have an exclusive bathroom to use on that floor. The mattresses need replacing. The main bedroom upstairs did not have draperies. The couple that used it felt uncomfortable. It was warm in the evenings upstairs. It does cool off after the sunsets, but until then it was too warm to go upstairs.We really did not use the “movie room”, but I could see it being used in the winter. It got stuffy the one night we watched a movie, and without a window there was no way to remedy that.We were allowed to drop off our luggage early to make room in our car. Thank you! That really helped us a lot. The group liked the idea of a keyless entry. No keys to share or get lost, just a code. We could all come and go without a problem.Thank you also for the TY card when we arrived home. That is a dying art. It was very thoughtful and appreciated. This is a beautiful home. My favorite part of the home was it had two master bedrooms each having a wonderful garden tub to soak in after a cold day in the snow. The hot tub was my daughters favorite thing to relax in. The views are amazing and the house was stocked with necessities most vacation homes I have stayed in haven't had (play pen for the baby, robes, slippers, spices for the kitchen, WINE opener and glasses LOVE and much more). The owners were very nice and easy to deal with and I am excited to stay at another one of their homes in the future. This was our first time to Jackson Hole and it was quite a beautiful place and was happy to have a home that was this great. Definitely giving a 5 star review and will be back in the near future. Loved the place. Great location and very suitable for our group of 9 (4 families). Very well appointed/stocked with everything you need. Really a top-notch house. Nearby (walk-able) grocery store convenient for most things but Jackson has fully stocked grocery stores - 15min drive. Only complain is the beds are pretty worn - very surprising due to the niceness of everything else. Thank you for staying at our Jackson home and appreciate feedback that allows us to do better. We always work to better meet the expectations of our valued customers. But we just replaced some mattresses recently, but not all of them. We will check our mattresses again, and bring attention to the owner. My family of 16 visited Grand Teton in July for 5 days. The house is beautiful and very clean. We enjoyed sitting at the dining room table to talk about our plans for the day during breakfast and recapping the activities of the day over dinner. We had plenty of room to spread out. The movie room was the kid's favorite place to hang out. We loved that we could walk to the various shops and restaurants in Teton Village from our house. The Moose-Wilson entrance to Grand Teton National Park was only about 5 - 10 minutes from the house, which allowed us to avoid the downtown Jackson Hole traffic. We did have time to do some shopping in downtown. The Russell Mace Homes team was excellent in responding to all of my inquiries. We really appreciated the snack trays. It was a pleasant surprise when we arrived home after a long day of hiking. Thank you for making our stay at the house so enjoyable. A beautiful home with a fantastic location but it should not be advertised as a 6 bedroom/6 bathroom house. The 6th bedroom is really just a very small, windowless room with a bed jammed into it on the bottom floor without the stated bathroom (which is upstairs) and has no air circulation, which I assume is why there is a fan next to the bed. The couple that stayed in the room were miserable the whole week so the rest of us kicked some money back to them as we all felt awful. All of the other bedrooms/baths were perfectly fine, with plenty of light and a decent bathroom. But everything else about the house was wonderful, the living room/dining room area was great and the very large table made for fantastic group dinners. The kitchen is huge with tons of appliances and cooking hardware and we had some great meals come out of it. Also, a large, 2 car garage made getting in and out the house with luggage and groceries a breeze. Also, it's only a short walk to the village so dining and drinking can be done without driving which is always nic. We loved the house but I can only give it 3 stars due to the lousy 6th bedroom. We apologize for the discomfort you experienced, we strive for the best and appreciate feedback that allows us to do better. We are happy to know that the rest of your experience at the home was pleasant. It looks as though the description provided to you by our listing agent was misleading, we will address this with them right away. We try to ensure accuracy with our affiliates in the descriptions of our properties. The home was everything we expected. Very cozy and well stocked from the linen closet to the kitchen pots and pans. We loved the ski in ski out, hot tub, fireplaces, theatre room, etc. Thank you to Russell Mace Homes for making my family vacation a memory of a lifetime! Note the rate is varying by season until reservation is confirmed. Please contact Russell-Mace Vacation Homes. Refund Policy If your reservation is canceled up to 30 days prior to your arrival date, your deposit will be refunded to you less a $100 processing fee. No refunds will be made if the cancellation occurs within 30 days of your arrival.